Online Car Portal Script will attribute with any dealership website. It has a great car business system. If you have been pursuing for an intuitive car dealership script, it will assist you and help you to manage car details more convenient. This script is suitable for a car dealer and start-up entrepreneur. Apart from listing, this script has some recognized amazing functionalities, like PayPal Payment integration, loan calculation, online shop management, high level advanced search model, Google optimized, multi-language support. It is easy to install and supports a group to survive proficient technicians. The greatest advantage of this script is that you can compare for your favorite cars along with costing and technical specifications. This script has persuasive online shopping cart implemented in it. 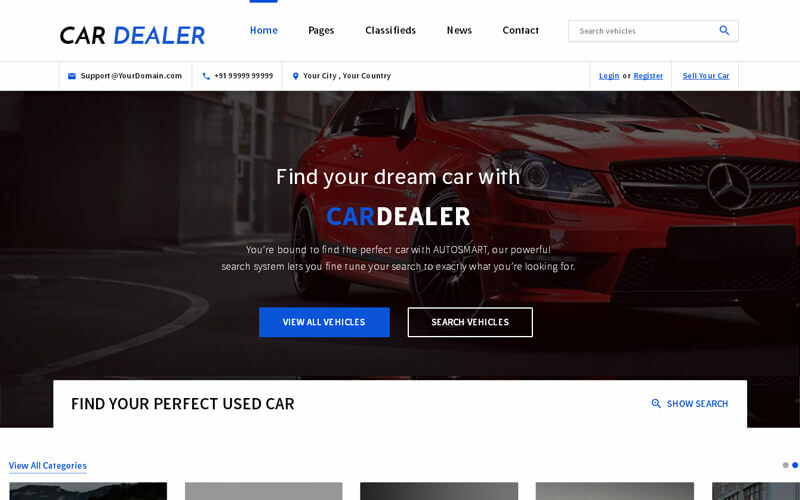 This car dealer website design script has an added advantage of progressive search option which is used to search by some keywords like condition, body, make, model, year, transmission type, interior and exterior color. Through this website user can procure the car. This script has procurement in different modes as single dealership mode and multiple dealership modes. Administrator can monitor everything with ease. We provide the full source code which is not encrypted, so you can make modifications in them. The design can be customized to match your needs and they can be used with different templates. Clean and beautiful template! Well done! Must say it’s a really well built theme, infinitely customizable, perfect for my latest project. I have bought this script last week from PHP scripts Mall. Really amazing work. I have received the automobile industry script on time. Support team helps us for full installation. Thank you.